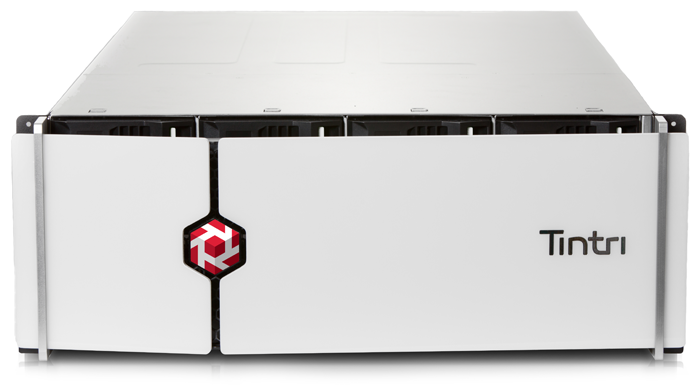 The Tintri VMstore T800 series is designed to address the needs of virtualization and cloud environments. Traditional storage is a mismatch for the specialized demands of virtualized workloads, requiring complex configuration, significant over-provisioning and ongoing optimization and management. VMstore addresses the challenges traditional storage platforms pose when virtualizing critical server workloads such as Microsoft Exchange, Microsoft SQL Server, Microsoft SharePoint, Oracle and SAP databases, end-user desktops, and cloud architected workloads. Built using the industry's first and leading application-aware storage architecture, the Tintri VMstore T800 Series sees storage at the VM and vDisk level—learning and adapting to rapidly-changing workloads, eliminating mundane storage management tasks and delivering substantial improvements in performance and density over legacy storage. The Tintri VMstore T800 Series is ideal for virtualized and private cloud environments in midsize and large enterprises that manage hundreds or thousands of virtual machines. Applicable to multiple use cases, this product line satisfy a variety of workloads such as persistent VDI deployments with mixed end users, database and other business critical applications, data protection and disaster recovery, and cloud environments with large numbers of automatically deployed virtual machines and an overall high rate of change. Realize the full potential of virtualization with intelligent storage. Set-up in minutes with support for multiple VMware vSphere or Red Hat Enterprise Virtualization datacenters. Manage storage at the level of VMs and vDisks, not LUNs and volumes—eliminating complex configuration or ongoing tuning. Get 99 percent of IO from flash, for all-flash performance without the all-flash price. Serve hundreds of different types of VM workloads from a single VMstore with dedicated IO lanes per vDisk and performance allocation—eradicating the impact from noisy neighbors on other virtual workloads. Eliminate bottlenecks and troubleshooting overhead with infrastructure insight. Get a single view of all VMs stored and identify performance and capacity trends without the complexity associated with low-level storage constructs. Instantly identify performance hot spots at the hypervisor, network and storage levels with comprehensive performance visualization. Leverage optional Tintri Global Center software* to monitor and administer multiple VMstore systems and resident VMs from a single control pane. Stay in control of virtualization environment while VMstore eliminates mundane storage management tasks. Protect individual VMs with customizable policies for VM-level instant space-efficient snapshots—eliminating the complexity of LUNs and volumes mapping. Store up to 100 TB of effective capacity with inline data reduction. Create hundreds of high performance zero-space VM clones locally or remotely. Ideal for speeding up VDI deployments and for development/test workloads. Protect data with optional SecureVM software* to encrypt data inline using 256-bit AES algorithms and without impacting performance, with in-built key rotation. Designed specifically for virtualized applications, VMstore automatically configures itself based on your environment and provides a complete end-to-end view of all virtual workloads. VMstore maintains constant communication with your entire virtualized environment. Actively changing VMs are tracked and highlighted so you have status on a moment-by-moment basis. Because of unique per-VM data management and operations, VMstore can make adjustments including a dedicated IO "lane" per VM to maintain the best service for all virtualized applications. Packaged as a storage hardware appliance, Tintri VMstore goes from box to rack and running VMs in a matter of minutes. There is no complicated configuration: simply assign an IP address, connect your virtualization management tools and begin migrating or deploying VMs. Tintri VMstore uses a purpose-built storage architecture designed to provision storage for individual VMs and vDisks, increasing productivity for virtual administrators. There is no RAID, LUN or volume configuration required with Tintri. Tintri OS provides complete control over the Quality of Service (QoS) at a VM-level, independent of capacity. It eliminates the guesswork in traditional QoS design & delivery with visualization of performance resources & contention at a VM-level. Enabling performance protection and throttling is as simple as drag and drop to set min and max IOPs. Delivering 99% of the IO from flash, a single Tintri VMstore supports up to 3,500 virtual machines with high performance and consistent sub-millisecond latency. This results in the industry's best VM density, storage density and lowest cost per virtual workload. Tintri VMstore eliminates the "noisy neighbor" problem typically found in traditional storage by allocating appropriate performance resources for each VM automatically and transparently. Tintri gives each VM its own IO "lane" so your virtualization or private cloud environment gets application-optimized performance without complex policies or manual tuning. Your applications receive the best performance right out of the box, even with mixed server, desktop and cloud workloads. Tintri VMstore enables you to take or schedule instant, space-efficient native snapshots of individual VMs. These per-VM snapshots can be efficiently replicated over the WAN with ReplicateVM™ (licensed separately). This means easy, automated data protection and higher service levels for individual VMs without having to replicate whole LUNs or volumes as with traditional storage. You can rest easy with support for 1 minute RPO on Tintri VMstore. Tintri VMstore can instantly provision high-performing and space-efficient clones of individual VMs. Per-VM- cloning along with features such as auto-alignment and performance isolation makes VDI and virtualized dev/test a simple, risk-free reality. Tintri VMstore monitors every I/O request at a vDisk and VM. Administrators can use Tintri VMstore to instantly visualize where potential performance issues exist, whether on the storage, host or network. When is the last time your storage helped you troubleshoot a network issue? With Tintri, scaling to support thousands of VMs is easy and cost-effective—just add more VMstores. With Tintri Global Center (licensed separately), you can monitor and manage up to 32 VMstores and over 100,000 virtual machines from a single interactive web console or with few lines of code, making scaling storage for virtualization and private cloud simple and efficient. You can construct and manage dynamic groups of VMs and apply storage policies. Tintri smart storage is the perfect solution for the challenges of private cloud. Adding automation and self-service to your virtualization environment, or re-architecting applications for the cloud increases both the number of VMs and the rate of change in your environment. Can your current storage handle many more virtual machines and a much higher rate of change while maintaining performance, QoS and manageability? Tintri smart storage can. 3 Effective usable capacity is calculated after data reduction, which provides up to 2.5x capacity saving from compression and deduplication from per-VM cloning. Tintri challenges convention — what we call the ‘storage quo’. Our VMstore product takes a completely different approach to address the underlying root causes of storage pain. Over the last two decades, companies have embraced virtualization — more than 75% of applications are now virtualized. So, to deliver the best performance, the unit of storage management SHOULD be the virtual machine. Alas, storage providers force you to operate in LUNs, volumes, RAID and more. Not Tintri. Challenging convention means breaking that paradigm. Tintri is the ONLY storage provider that lets you see and act at the VM-level. Our density and speed are best-in-class, but we know that those alone won’t fundamentally change the way you manage storage. We architected our file system to offer you direct visibility into your VMs. That replaces guesswork with precision and automation, and eliminates the root cause of storage pain. When there’s a performance problem on a critical VM, set a QoS policy on it that robs performance from somewhere else. When you need to move that VM or when something changes in the storage environment, re-adjust all the QoS policies to try to maintain performance. Iterate until your head hurts. Tintri provides VM-level performance isolation and optimization out of the box. It eliminates the guesswork involved in traditional QoS by providing granular visualization of performance resources & contention at an individual VM-level. Do you need to set a min or max threshold? No problem. Simply drag and set min/max IOPS and you’re done. What’s the performance impact of your QoS setting? Simply click on the VM to see the latency contributed by host, network, storage and QoS throttle. We appeal to change agents. They know that when you challenge convention you make an impact. Here are three examples of what happens when you can see and act in VMs. When there’s a latency problem, point fingers at the host, network and storage. Troubleshoot at the LUN level. Open Tintri. Immediately spot the specific VM experiencing a latency issue. See right there — with zero clicks and zero investigation — a simple visual (with numbers) that shows whether the latency is coming from the host, the network or the storage. Fingers used for high fives, not pointing. Manually tune your storage or re-schedule system activities as load profiles change to try and avoid quality of service issues. Fear the noisy neighbor. Assign every single VM its own lane to guarantee quality of service. We’ve built a solution that is smart enough to know how to handle bursts, and to balance load through automated tuning. Address performance problems by investing in high-cost flash or intentionally over-provisioning storage. Apply Tintri’s secret sauce — Active Working Set — to deliver >99% of IO from flash. That is pure performance at the lowest dollars-per-VM on the market. We can win your business on dollars-per-gigabyte too, but we know that as you add more and more VMs, it’s the former metric that matters most. 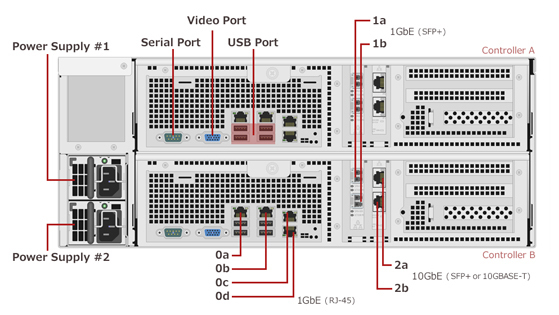 Download the Tintri VMstore T800 Series Datasheet (PDF).